While I'm usually fairly food focused here, I wanted to share a round up of great spots to grab a drink that we discovered. 1. If you're craving an Old Fashioned or Manhattan, visit Irish Heather in Gastown where they make simple, craft cocktails without a lot of frou-frou ingredients or garnish. 2. After a long morning walk through Stanley Park, we emerged in the West End and decided to pop into Three Brits Public House to watch a soccer match. 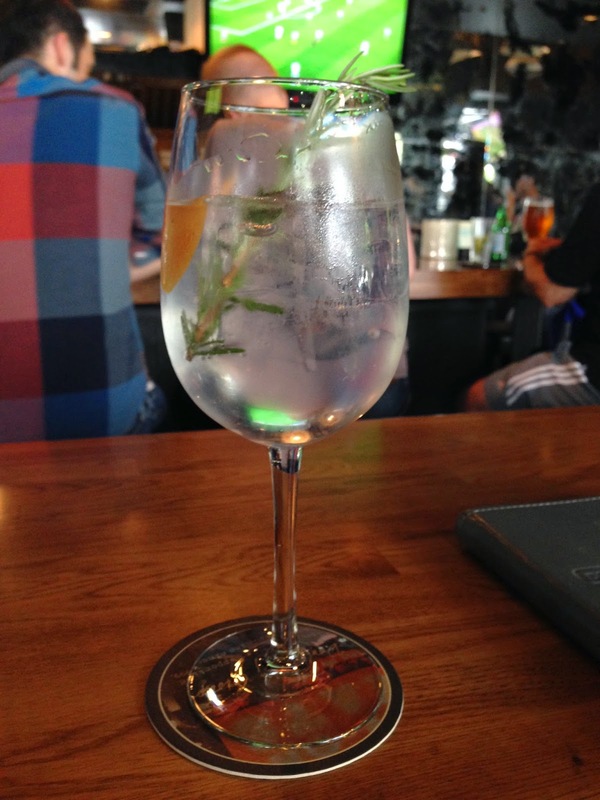 I ordered up this gin n' tonic, which had grapefruit bitters and rosemary. (I've now added both to my home bar.) In addition to great drinks and plenty of TVs to watch sports, on a gorgeous day, the windows open up to a wonderful waterfront view and breeze. 3. After a dinner at Pidgin, we asked our server where to go to get away from the tourism and he steered us to Diamond. It's a great spot for post-dinner cocktails by candlelight, nestled in a second floor perch overlooking Gastown's late night antics. 4. We also made repeat visits to Bambudda in Gastown where the street-side barstools and amusing bartenders guaranteed a great start to an evening of exploring restaurants. 5. Ok, and rounding out the list would be one that I already wrote about, but Rodney's has the most dangerous bartenders in town. Check out that pour.